I've always had this vision, this big dream, of how the holidays would be when I was grown. Me cooking a big meal. An entire evening of fellowship and love. Life doesn't always go the way we dreamed of as a child, does it? 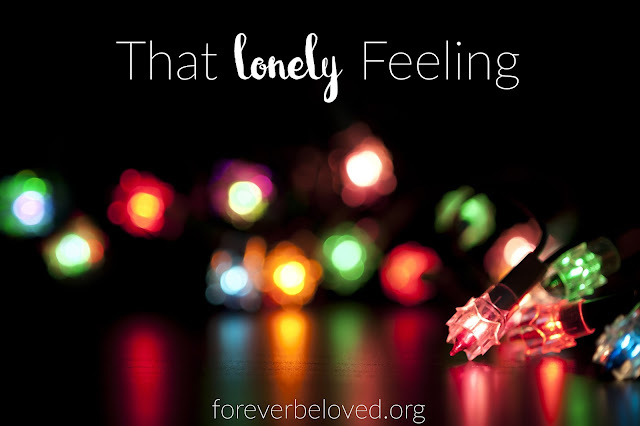 I have a confession: sometimes I feel lonely during the holidays. It's something I don't often talk about at all because it makes me feel guilty. Why do I feel guilty? Because I have a husband and two kids to spend the holidays with, not to mention two amazing parents. Still, the loneliness is there. When I was a child, holidays were spent with family. Thanksgiving at my Grandparents, Christmas Eve at my Aunt and Uncles and Christmas Day at my Grandparents. I loved it, I soaked in every single moment of being surrounded by laughter, love and the feeling of belonging. Do you remember the days when after the holidays you would go to your families house and they would show you what they got for Christmas? I know, I loved that! Once I got married, the family we spent the holidays with doubled. Sometimes holidays even meant visiting two or three different houses in one day. I have to admit, I loved it. Maybe more than loneliness, its' a heart craving. A craving and desire to have things the way they used to be. I have this desire to hostess, to show hospitality by making my house warm and welcome and to show my love and thankfulness through the food I cook. Throughout the years, the seasons of life have changed. Between people passing away, children growing up and moving out and just life changing we've been left spending holidays among our little family. Thanksgiving at my parents, Christmas Eve at home, Christmas Day at my parents and New Years Eve at home. It's certainly not how I envisioned my life. But, what I've realized throughout this, the holidays are not about me and my feelings. The season is about Him. Thinking of Jesus’ humble, magnificent, unimaginably difficult, astonishing birth stills my heart during the Christmas Season. It helps me to align my heart with joy. This holiday season when I feel the familiar pangs of sadness and loneliness creep over me, I will look up and focus my eyes on Him. I will be reminded that what I have is enough. I will remember that He IS the most important element in my life. He brings TRUE peace, joy, and celebration in the midst of this season. He is the TRUE reason for the season.